Saudi authorities have ‘opened’ the world’s largest clock overlooking Mecca. Bearing more than a passing resemblance to the tower housing Big Ben in London, it will be much bigger: the clock diameter will be 151ft across.The building itself will be the second tallest building on earth. If someone travels to Mecca or lives there, he lives longer, is healthier and is less affected by the earth’s gravity…You get charged with energy. Does he not realise how absurd he sounds? More generally, I am fairly appalled by this whole development. Whilst I am no Islamic scholar, I simply can’t believe that it is in keeping with the notion of an Islamic pilgrimage – the arduous trek [the pilgrimage itself] being a test of faith etc – that the new 6, 7 or 20 star hotel in Mecca will have a chocolate sommelier. It just seems wholly wrong to me. I have to agree with you on this post! I found the whole idea of the clock a little absurd IMO. If they really wanted to have the biggest clock, it should have gone to a different city. Not out of disrespect for Mecca, but it is a spiritual city, and one that only Muslims can visit. They could have had it in Riyadh or Jedda. David : No, a lot of them don’t and that’s a real problem. And unless I’m mistaken, luxury and comfort doesn’t lessen a pilgrimage, nor hardship heighten its reward, it just happened that for a lot of people getting there was arduous and dangerous, and the place itself had not much to offer in that chapter. If not, people of the area would have had to get to get to Yemen or Egypt and back so their own pilgrimage be worthy, no such thing in my knowledge. I understand your point xoussef – but the largest clock in the world? Do they really need that in Mecca? That is a landmark, and thus it should have gone somewhere else (if it was necessary to have). Keep in mind that people don’t time their prayers to time only, but to the call to the prayers. In Mecca, this can be heard practically everywhere. Yes they could’ve had a big lock there – but the biggest in the world IMO should have gone somewhere else so that it can truly become a landmark. As it stands, 4/5 of the people who live in the world cannot see this grand clock because they are not allowed into Mecca. You mean someone actually needs a gigantic clock ^^ ? I guess my point is, that thing is just as pointless in Mecca as anywhere else, which paradoxically makes it as relevant in Mecca as it could possibly be. 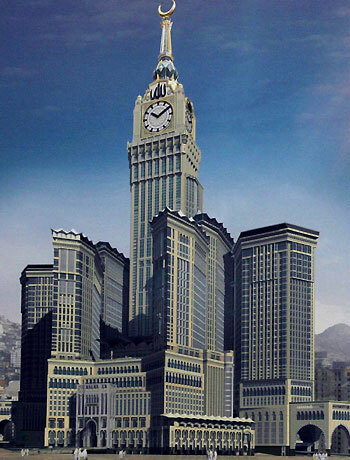 I can’t help but being furious at Saudis for spending this huge amount of money for building this clock tower. there are poor muslims in the world that need this money. there are other ways that need such money. we need the world to know and respect Islam first, so that they follow our timings instead of GMT. this is waste of money Allah has given them, and 7aram to waste it like that. the y only want to influence the spirituality of mecca. they want to disturb the image of Kaaba. I know some people in my country paid hundred over thousands of dollars for a Hajj package which include first class ticket with above 5 star hotel room just a step away from Kaabah. What is the point? You are right, it is suppose to be a journey that test the faith of a Muslim. i agree with you. this is so wrong.